1. Preheat the oven to 200ºC, gas mark 6. Place the peach halves in a single layer in a roasting tin. Mix together the spice, yogurt and mint and spoon half this mixture into the hollows. Bake for 15–20 minutes until tender. Cut the peaches into wedges. 2. Toss the beetroot with the remaining yogurt and mint dressing. 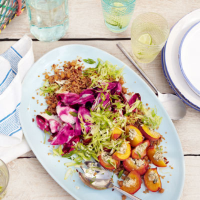 Arrange the warm peaches and beetroot with the salad or quinoa mix in a shallow salad bowl. Scatter with the salad onions and serve. This recipe was first published in Tue Jun 18 16:15:45 BST 2013.